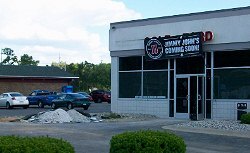 7 June, 2012, 09:17 pm in "June 2012"
Over the last year, I've heard more rumors about a Jimmy John's coming to Coldwater than any other business. And, according to the Jimmy John's website, franchise opportunities are currently NOT available anywhere in lower Michigan. Nevertheless, an entrepreneur must have "sweet talked" corporate HQ, for a sign is now up - Jimmy John's is definitely coming, and it looks like they're already working on cleaning up the building for it. It will be located in the former Cole Story used car sales auxiliary building right next to the Coldwater Garden restaurant. By the way, on the other side of Coldwater Garden, a Culver's is still definitely planned, but, not surprisingly, the environmental clean-up has continually delayed the project... as of today they STILL haven't broken ground. But stay tuned!